You said in an interview once that John Lennon’s harshness was just for show, what was the John you knew like? I felt that John’s harshness was a safety mechanism. He didn’t like to let people too cluse, but if you were as I was close to John, there was a very soft side to him. A caring side. What’s your favourite ice cream flavour and cupcake toppings? Sorry, not really keen on sweet things. I couldn’t say. How did Neil Aspinall get involved with The Beatles? Neil was a Casbah member. He become a very close friend of the family. Neil and my mother fell in love and were together for eight years, a relationship which produced my younger brother Roag. Neil was studying to become an accountant. He was short of cash and we needed a driver. I asked if he would like to drive The Beatles and he said yes. Hey Pete, we really hope that you might do UK tour, playing and answering questions. Any future plans for that? We’d love to see you! I will be doing the odd show in the UK next year. 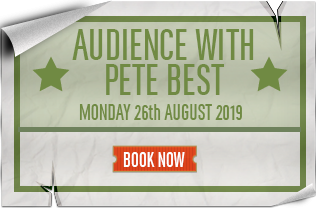 My website PeteBest.com will have the details of the shows as they are confirmed, so keep an eye out! What Beatles track is the one that you most wished you played on? All of them! Ha ha! Why did you turn down Rory Storm and The Hurricanes? I had been with the number one group in Liverpool. I didn’t feel Rory Storm and the Hurricanes was an option. Sorry Rory! How was your relationship with Stuart Sutcliffe? I had a great relationship with Stuart. He was a quiet man but when he had something to say it was worth listening to. What is your favourite memory of being Beatle? Too many favourite memories. It was a wonderful time, full stop. Can you play to a click track? I have on a number of occassions, especially when we were recording Hayman’s Green. Did you realise just how big the Beatles were going to be while you were still with them? We knew we were going to be big in the UK. We always had that belief, but what followed none of us could have imagined that! How did you feel when you were replaced by Ringo? I was upset. It made no sense at all. The rumours that followed about my drumming were very hurtful. I liked Richie. I have no gripe with him at all. He was offered the best gig in town. He would have been a fool to turn it down. Hayman’s Green is a great album. Do you have plans to do another one? Thank you and yes, but when, who knows? Not me!